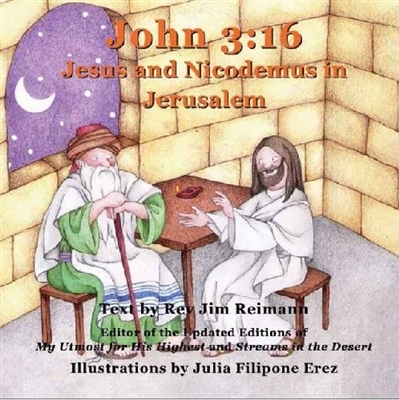 John 3:16: Jesus And Nicodemus In Jerusalem by Jim Reimann. Paperback. SAVE 83%. Full–color softcover, 16 pages, Ages 3–9, 8 1/2" x 8 1/2"
Jim Reimann has led more than 25 pilgrimages to Israel, which helped him to make these stories not only biblically correct, but also historically accurate. Each book includes a note to parents and teachers indicating the Bible passage upon which the story is based. This makes each book useful for families or classes with wide–ranging ages.